Brock Lesnar is reportedly in line for a seven-figure payday when WWE returns to Saudi Arabia on November 2nd. Lesnar made a surprise return at Sunday’s Hell in a Cell pay-per-view. During the main event between Roman Reigns and Braun Strowman, Lesnar’s music hit and The Beast Incarnate hit the ring. Lesnar kicked down the padlocked door, entered the cage and went berserk. He laid waste to Reigns and Strowman and the main event ended in a no contest. After the pay-per-view went off the air, fans in the arena chanted, “This is bullsh*t” at the inconclusive match finish (Video). It was Lesnar’s first appearance for WWE since dropping the Universal Championship at SummerSlam. The live event on 11/2 is part of WWE’s lucrative 10-year deal with the country. The Greatest Royal Rumble back in April was a financial windfall for WWE. Based on WWE’s quarterly business statement, the show brought in an estimated $45 million. The show was more profitable than even WrestleMania 34. There is a ton of money being thrown around and WWE plans to stack the show with as much A-list talent as they can find. 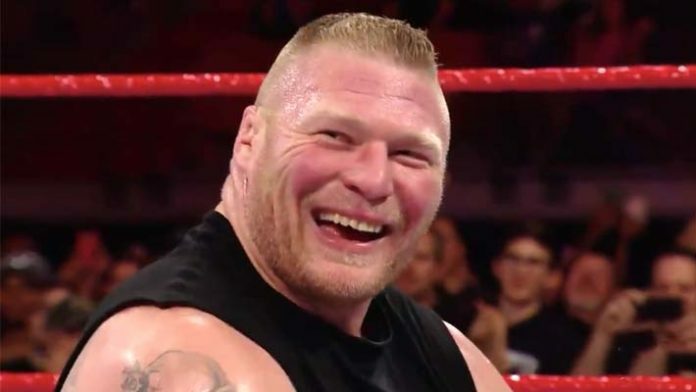 According to Dave Meltzer (via MMAFighting.com), Brock Lesnar will be making “well into the seven figures” to wrestle in Saudi Arabia. Expect to see Lesnar involved in the Universal title picture on that show. He could face Roman Reigns in a single match or be part of a 3-way match involving Braun Strowman. WWE Hall of Famer Shawn Michaels is also rumored to be coming out of retirement in Saudi Arabia. Michaels is being advertised as the special guest referee for the Triple H vs. Undertaker match at Super Show-Down on October 6th.